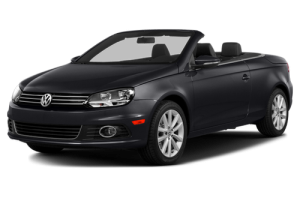 Rent a convertible in Prague – Volkswagen EOS – bright, stylish, eye-catching! This is a four-seater coupe-cabriolet. One of the distinguishing features of the Eos is the folding roof design. It consists of five sections and has a special mechanism due to which the top did not fold, but moves into a special compartment. This solution allows you to clean the roof in and at high speeds. By the way, the folding process takes only 25 seconds. Rent a cabriolet car in Prague to make your trip around the Czech Republic and Europe unforgettable! Book Volkswagen EOS in one click! or fill out the booking form completely!